Great News! 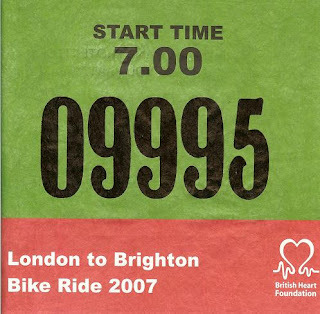 - My Entry for the 2007 London To Brighton Bike Ride is confirmed! (Bit of an early start, but that should mean less traffic!). 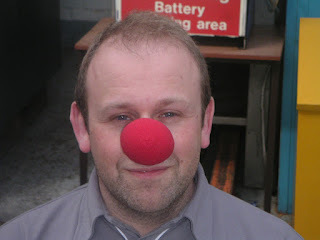 - Click HERE to Sponsor Me! On a more serious note, i am now into my forth week of Laryngitis which has therefore meant no exercise/cycle training for four weeks. Assuming a recovery is imminenet i would hope to resume training & up the ante for a midweek training ride of say 10-15 miles. Other benefit of this nasty illness is weight loss! 7lbs so far. Sometimes, things should just be left alone. 12:05PM 16/03/2007 & all is calm. 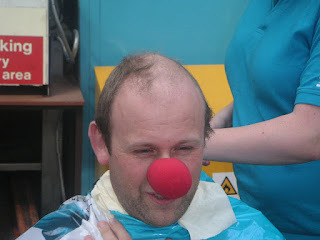 It's red nose day & over £400.00 has so far been pledged; it's time for the head shave. 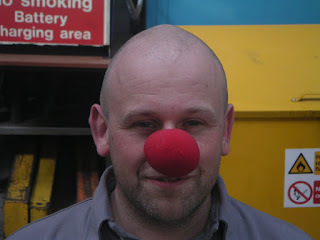 The clippers have been purchased, the crowd is waiting & the obligitory red nose is in situ. Location = A "Functional" workshop inside an industrial unit somewhere on an estate in Winchester, Winnall, UK. Barber(s) = Lisa Finch (Secretary), Bob Thomas (Administrator). There is laughter. Lots of laughter. Cries of "Oh my God", "What have you done". Lisa is struggling to scalp me, & so hands over the clippers to veteran Bob "Razorhands" Thomas. Cool as you like, Bob gets to work & calmly/cooly continues the hair excavation works. & there you have it. Head shaved. At time of writing, the amount pledges = £476.00. So only £25.00 to go before the back wax becomes reality. So there we have it. 1 week ahead of schedule & the target is reached. In 7 days time i will have a bald head & become an honoury member of right said fred. So far my good friend Simon is the highest donator, & the reward for his generous donation will be a journey to Winchester to do the shave in front of all my work collegues. So whilst i contemplate a life of baldness, where to buy clippers, no more washing hair etc. i'm hoping the donations keep coming.